It’s that time of year again…when ghouls and goblins come out to play and pumpkins scream in the dead of night! You’d think that a scaredy cat like me would hate Halloween, but it’s more treat than trick if only because of costumes. 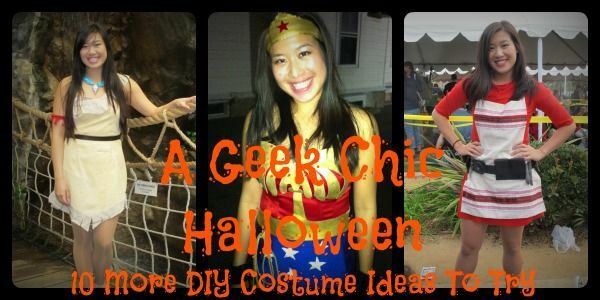 If you read last year’s post A Very Geek Chic Halloween: 10 Geeky DIY Costume Ideas, you know that I have an unhealthy obsession with making costumes. So, this year, I’ve come up with 10 more DIY costume ideas to help you embrace your inner geek! DIY! For me, the fun is in the making of the costume. You don’t need to buy tons of fabric or materials: use what you have on hand! Thrift! Stores like Goodwill and Salvation Army are a goldmine when it comes to finding Halloween costume components. For instance, I altered a $4 thrift store dress to make the Pocahontas costume in the header. The red bustier I used for Wonder Woman was another Goodwill find, and the gold accents are made from a pair of leather pants that I cut up and painted. Repurpose! Scrounge around your room for household items that can be manipulated into costume pieces: for example, the apron in the Oswin costume was made from a $1 IKEA pillowcase. I’ve also used aluminum foil to make Starfleet badges. Borrow! Most of the costumes listed below use a variety of “normal” clothing, which you may or may not have already. Try scavenging through a friend’s closet – it may be that you each have an item that the other needs to complete a costume! Be creative! A costume with a mash-up concept is always fun. Think Hipster Disney Princesses! Don’t have your costume lined up for Halloween yet? Try out of one these geeky getups! These tuxedo stripe trousers are remarkably similar to Han’s. (Plain navy or black pants work as well; you can also DIY the stripe by stitching a ribbon along the pant leg.) Any long-sleeved white or cream blouse will do – just make sure to add an edgy black vest. And don’t you just love a costume that lets you wear comfortable shoes? 2. The Fox from What Does The Fox Say? Instead of shelling out for a fox costume that you’ll only wear once, just pair an orange cardigan or jacket with a white cami and a pair of orange trousers (an orange skirt with black tights would work as well). You can buy costume fox ears and a tail, or try your hand at making your own by hot-gluing craft felt to a headband. Finally, try this makeup tutorial to get that mysterious Fox look. If you’re a Miyazaki fan, why not put together this simple costume inspired by the protagonist from Kiki’s Delivery Service, a sweet film about a young witch coming to age? Plus, for those who don’t understand the reference, it’s still a witch costume! Pair a navy dress with red flats and a cute hair bow (if you can’t find a similar headband, try making your own with craft felt). If you don’t have a broom lying around, pick up an inexpensive Halloween broom prop. A messenger bag holds your “deliveries” as well as any essentials you might need to carry around on your big night out. Argyle socks and moccasins round out the look, while a pair of crystal earrings reference Heisenberg’s “Blue Sky” product. If possible, get a hold of a pair of old-school glasses, a fake mustache, and a gas mask (this one’s less than $10 on Amazon) to complete the costume. After taking a lot of heat from friends for not watching Avatar (the animated Nickelodeon one, not the one with giant Smurfs), I’ve finally gotten around to watching the show. I’m loving it so far! Aang, the eponymous Avatar, is easily the most recognizable character from the show, with his flowing monk robes and arrow-emblazoned noggin. For an easy take on this flying-bison-riding hero, layer orange and yellow garments over a pair of brown leggings or yoga pants. If you have blue body paint, great! If not, try using eyeliner or eyeshadow to create the blue Airbender markings. This is a fairly easy outfit to assemble with things you may already have in your closet, like a white maxi dress and leather jacket. While the crossbow is optional, a cross necklace and a stake would definitely add to the costume. If you have other Whedonite friends, why not try and get a Scooby gang (complete with Angel) costume group together? Speaking of Scoobies and Sarah Michelle Gellar (what a smooth transition! ), Daphne and Velma from Scooby-Doo are two easy costumes to put together. Plus, the great thing about duo and group costumes is that more people are likely to recognize your character. To get Velma’s look, pair an oversized orange sweater with a red pleated skirt. Knee-highs and a pair of thick-framed glasses are essential! For Daphne, any purple dress will do. Accessorize with a neon green scarf and pink tights. Scooby-dooby-doo, where are you? P.S. Don’t do a Google Images search for “Daphne and Velma” on a school computer without turning on SafeSearch first… Rule 34 is very real! Here’s a costume that just about everyone will recognize: Misty the Water Trainer from Pokémon! The best part? 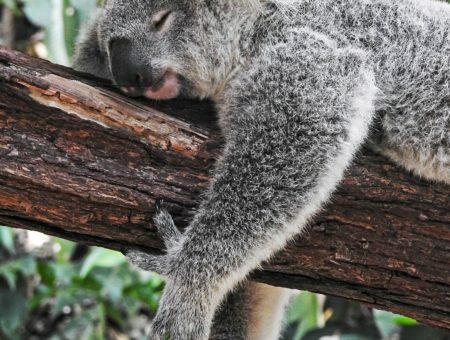 You probably already have a pair of denim cutoffs and colorful sneakers in your closet. The suspenders might be somewhat tricky to find, but you can always just tie red ribbon to your belt loops. There are a couple of options for Misty’s yellow top: since crop tops have been trendy, you can probably find an inexpensive yellow one in stores. If you’d rather be a little more covered up or if you just like to be more hands-on with your costumes, try cutting the sleeves off of an inexpensive yellow Hanes tee or a thrift store find. This way, you can adjust the shirt length to your comfort level. Psyduck and orange hair optional. If cutesy costumes aren’t for you and you happen to be a fan of NCIS, why not dress up as Abby Sciuto, the awesome forensic specialist and “the happiest goth you’ll ever meet”? Any basic black outfit will do – ideally paired with a tough pair of boots – but you’ll need a lab coat and goth jewelry to really pull off this look. Finally, pull your hair up into Abby’s trademark pigtails and apply a coat of vampy lipstick. On the other hand, if you prefer a more saccharine look, it doesn’t get much sweeter than Vanellope von Schweetz from Disney’s Wreck-it Ralph! This aspiring Sugar Rush racer may be cute, but she’s still one tough cookie. Are you a fan of DIY costumes? What are you planning to dress up as this Halloween? (I’m working on my Ping costume from the “I’ll Make A Man Out of You” sequence in Mulan!) Do you have any DIY tips to share? What does the fox say? Let me know in the comments!